It's a lot of work, letting the girls do the planning! 7:00-7:15: Horseshoe. The patrol leaders gave attendance, and the names of who presented badges and which badges, then we talked about upcoming meetings. Then we discussed the results of their badge planning. No patrol planned the Fitness Fun badge, so we will decide that. They all chose the First Aid badge to work on next. For the Hiking badge activities, we counted which patrols picked each activity and majority ruled. They agreed on 5 of the 6 activities. For the Hiking Challenge, they all chose the same activity, which was create a journal out of recycled materials, and only one other group picked a second activity, so that will be our second activity. I would have chosen the two activities that coincided with the Hiking badge. One thing I like about letting the girls choose is that it takes *me* out of my comfort zone and plan things I wouldn't normally plan! 7:15-7:30: Our Guide Store order came in a few weeks ago, and this was our first meeting where everyone (theoretically) had a program book. So we went over the programming that we've already accomplished, so they could check off their books, and see what we've done so far. For the girls who forgot to bring their books, it was a good opportunity for them to see why they should bring their books. 7:30-7:45: We did some more planning. One group planned a campfire for that night, one group planned a game or two for that night, and one group planned a campfire for another night. For the campfire planning, I gave the girls the Table of Contents from my own personal songbook that I compiled of songs that I know and like. For the game planning, I picked 10-12 games from Becky's Guiding Resource for them to choose from. 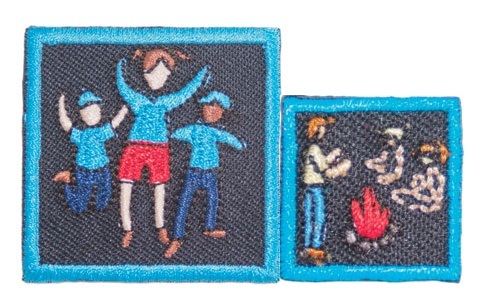 I'm surprised there's no credit in the Program Squares for Campfire Leading (though I know there is a badge for it). Interestingly though, when I look it up in the Guide Cross Reference (Excel doc), it gives YaO1#5, Taking Responsibility. I don't always remember to look at that file to see how it correlates the programming.